A gentleman wakes on an average, overcast morning. He performs his toilet, selects a suit from his wardrobe and flicks through his shirts for a suitable choice. White is the colour of choice for our hypothetical gentleman, simply because it is the default of the masses; were he to select a French collared check shirt, he would have no relevance to the majority. Then he sets about choosing a tie. He opts for a pale yellow plain weave silk, completes a Windsor knot and then turns from his mirror toward the door. What is wrong with this? Well, not a lot. Something which the masses would echo, en masse I have no doubt. However, when he catches a reflection of himself in a shop window on his way to the office, he notices something rather peculiar; he doesn’t appear to be wearing a tie at all. His tie is so pale, that from a distance, and in low light, it simply merges with the white; this contrasts sharply with the darkness of his charcoal suit (again, the choice of the masses) and creates a rather odd separation of the ensemble; the suit and the shirt and tie are not in concert, indeed they are not even in the same society. This, I have noticed, is a common problem. As a style touch, when shopping for neckwear a man should always know there is life beyond the pale. 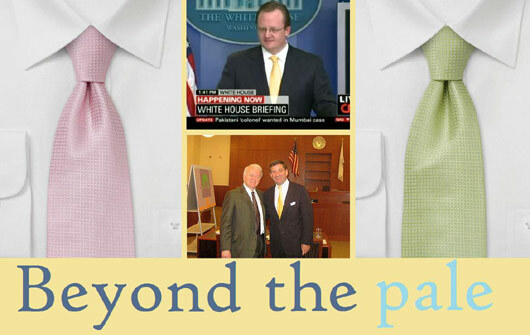 If a white shirt must be worn, darker ties will always look smarter than paler ties because they are more restrained, more ‘Monday morning.’ It is possible to pick up some very attractive and discreetly patterned darker ties that flatter not only the white shirt, but the charcoal suit it is worn with; the ensemble appears connected, sober and mature. When wearing a plain shirt, a little pattern goes a long way as far as neckwear is concerned; don’t follow the politicians with their PR-friendly Lego ties, go for a polka dot, a club stripe, or a foulard. There is nothing wrong with pale ties. They are certainly brasher than darker ties, so you must be careful where and when you wear them but also, what shirt and suit you wear them with. A cornflower blue is a better companion for a yellow or a pink tie than a white, so stock up on some saturated shirts. Resist the urge to match the pocket square to the pale tie. This creates a ‘modern morning dress’ effect and destroys the seriousness of an ensemble; not ideal for client meetings where dignified concern is required. The tie shouts loudly enough on its own. Lower the volume by selecting a more subtle square.